Fish and seafood are some of the healthiest foods available and salmon is even healthier than most. The benefits you receive by eating salmon are numerous. It’s one of the foods richest in omega-3 fatty acids, so it’s good for your heart and cardiovascular system, your cognitive and mental health, and it helps keep skin and hair soft and shiny. It’s also an excellent source of protein, low in fat and calories, and is rich in selenium, a powerful antioxidant that fights free radicals. Salmon has high levels of B vitamins which aid metabolism, too. The list of health benefits goes on and on. But how do you cook salmon so everyone in your family likes it? Take a look at these honey glazed salmon recipes and you’ll soon be turning fish haters into salmon lovers. This honey salmon recipe is quick and easy and ready in less than 30 minutes. It makes even weeknight dinners special. Preheat the oven to 400 degrees F. Line 9-by-13-by-2-inch baking pan with aluminum foil. In a small bowl, stir together the honey, mustard, butter, and Worcestershire sauce. Season with salt and pepper. Put the salmon fillets in the center of the pan and arrange the asparagus around the salmon. Sprinkle with the pecans and drizzle with the honey-mustard sauce. This sweet and savory honey salmon recipe is from an old Betty Crocker cookbook. You’re going to love the tangy sweetness and smoky goodness of this fish. Heat coals or gas grill. Remove salmon from marinade; reserve marinade. Place salmon, skin side down, on grill. Cover and grill over medium heat 10 to 20 minutes, brushing 2 or 3 times with marinade, until salmon flakes easily with fork. Discard any remaining marinade. 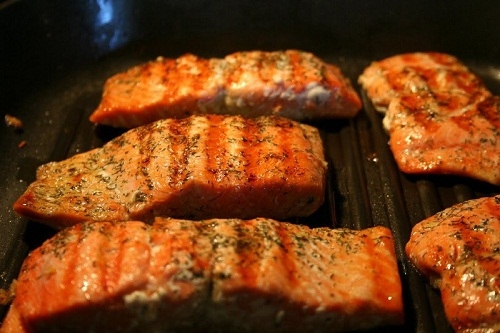 If the weather isn’t cooperative, broil your honey glazed salmon indoors instead of grilling. Easy and delicious, this dish can be prepared in under thirty minutes. Preheat oven to 375 degrees F. Then with foil, line a baking sheet. Whisk together honey, thyme, garlic, olive oil, white wine vinegar, salt and pepper as desired. Go easy on the salt. It tends to make the salmon drier. 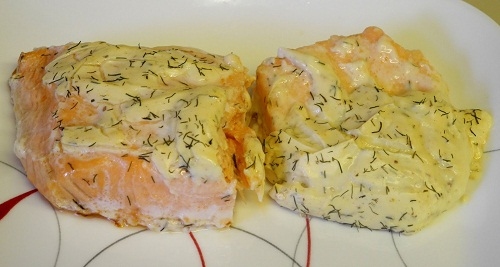 Place salmon onto the prepared baking sheet and fold 4 sides of the foil up well. Lay the honey mixture over the salmon using a spoon. 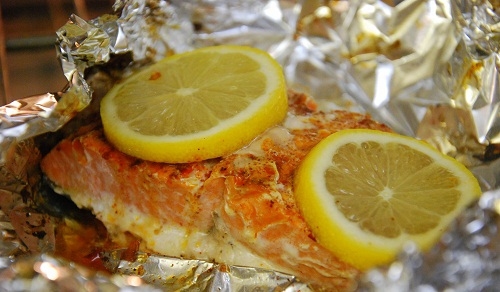 Fold the sides of the foil over the salmon; make sure it’s covered completely and the packet tightly sealed. These delicious honey glazed salmon recipes are the easiest way to get your family the outstanding health benefits from salmon without them turning up their noses at fish. Wild caught salmon are preferable over farm raised when you are seeking the most amount of health benefits.